a local printing house, that will eventually manage to print the book locally, making it a 100% Ethiopian job! 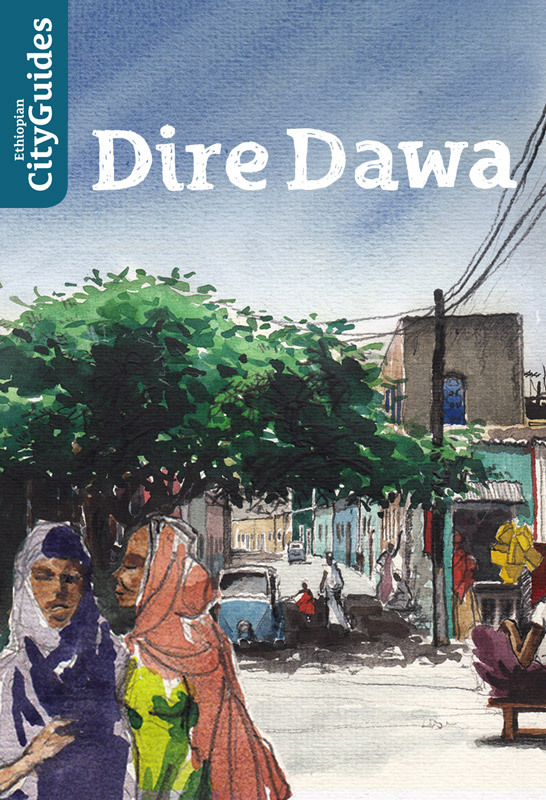 The first city guide on Dire Dawa was published in 2012. Dire Dawa, in Eastern Ethiopia, was the main station of the Djibouti-Addis Ababa railway. It used to be an active centre of trade and circulation of people (and ideas) between the Ethiopian highlands and the lowlands leading to the Red Sea. The city is now a sleeping beauty whose mix of western colonial-inspired architecture and vernacular architecture are decaying under the shadow of the bougainvilliers. The guide book was funded by the French Embassy’s Social Development Fund as part of a tourist promotion of the city. The guide was first published for the International Conference on Ethiopian Studies that gathered 450 international researchers in this quaint city. The guide was written by Thomas Osmond, Anthropologist, specialist of Sufism in Eastern Ethiopia, illustrated by Nicolas Deleau, a French teacher and talented artist, and designed by Jonathan Le Péchon, graphic designer in Addis Ababa. 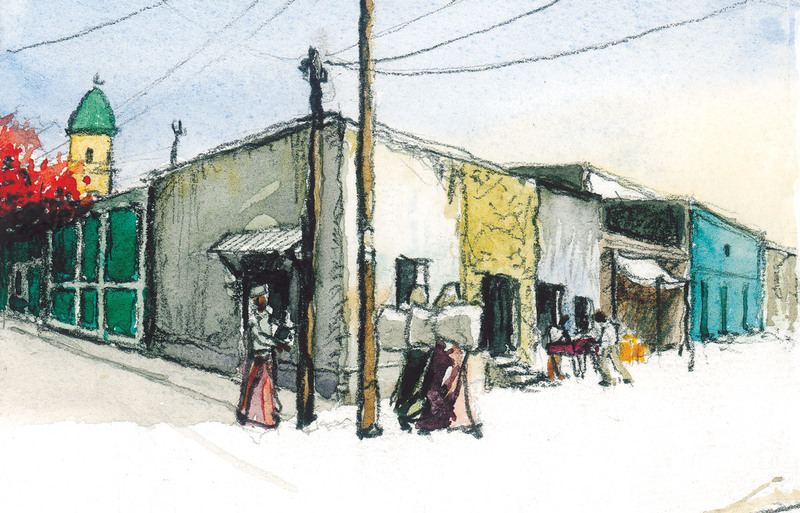 The watercolors are currently exhibited in Dire Dawa and will be displayed at the Alliance Française in Addis from 15 June 2015. If you’re around, they’re really worth the trip… Go and visit Dire Dawa! You’ll love it. Do not forget to chew chat, the guide book explains how to enjoy the experience! 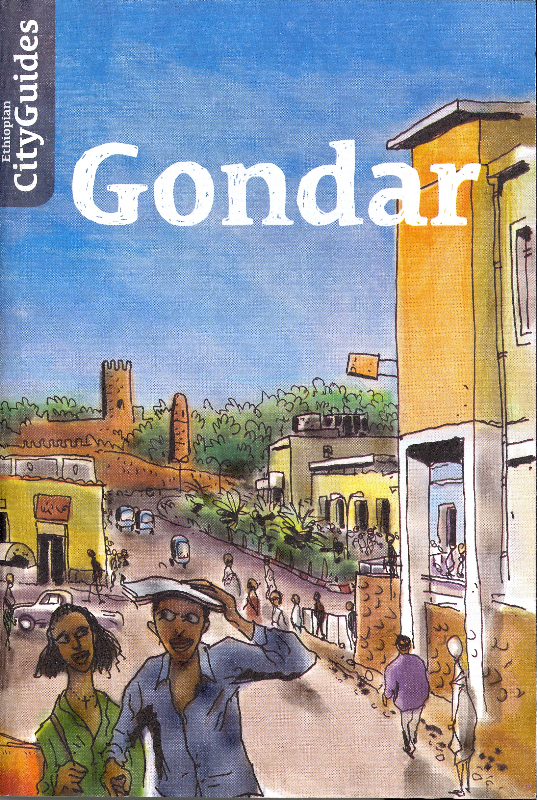 The second city guide on Gondar was released in 2015. Gondar was the capital of the 17th c. Christian Kingdom of Ethiopia and its skyline is still dominated by the so-called Ethio-Portuguese castles, registered as a UNESCO world Heritage site. The italian colonisers in the 1930s restored Gondar as a regional capital whose derelict colonial architecture gives a appealing charm to the city. The publication coincided with the achievement of the Ras Ghimb castle restoration. This mysterious 17th c. castle was forgotten by the UNESCO World Heritage and was restored by a twin cities development programme of Gondar and Vincennes (France). The authors are Sisay Sahile, a researcher and an illustrious personality of Gondar, Anaïs Wion, Historian (CFEE, CNRS) specialised on the history of the 17th c. Gondarian dynasty and Simon Hardy who managed the restoration project and now develops ecotourism in French Provence. The spirit of the city was brilliantly sketched by Manuel João Ramos, Historian and anthropologist (ISCTE, Lisbon), and designed by Jonathan Le Péchon. Last but not least, the publication of these books was made possible by the enthusiastic commitment of the CFEE directors Eloi Ficquet and Jean-François Breton. You can buy these books in Addis Ababa’s Book World shops (in the main hotels, and at the airport). For those abroad, I guess you can ask the French Centre for Ethiopian Studies to ship them to you. Enjoy your trip to the cities of Ethiopia ! Really very nice description of the whole project. I’m glad you like it, dear Sisay! Congratulations to the editors of the Ethiopian City Guides and to all the authors of this very nice Gondar guide. The forthcoming will concern old houses in Addis Ababa. Thanks ya mudir! Needless to repeat that your personal involvement contributed a lot to the publication of these guide books ! Just bought the Dire Dawa and Gondar city guides. ABSOLUTELY epic in every way. Thanks for such an outstanding work that will expose the hidden treasures of Ethiopia and wash away the tarnished imaged. We have been working on a website for 2yrs now that will serve as a tourist and investment guide covering all corners of Ethiopia. Any advice?